The areas of your landscape can be divided into several sections and areas, which are also known as garden rooms. Garden rooms are spaces where you plant, grow, and display different ideas in gardening in various creative methods. One garden room could be a rose garden, while another could include the use of a water garden, while still another garden room in your landscape could include the use of just purple flowers. Garden rooms are your creation, and only limited to your imagination. To create the rooms in your landscape where you can be both different and creative you need to actually create some type of walls in your gardens. The walls in your gardens are going to be grown from other larger types of plants. 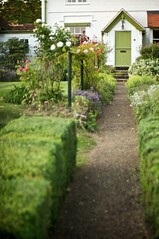 Living fences are one ‘way’ that you can create garden rooms.